In January 2016, I’ve asked on the Mathematics Q&A site the question called “Most wanted reproducible results in computational algebra“. I hope that making a list of suggested experiments to reproduce will be useful to those interested in checking them twice ;-). For example, one could submit their findings to a journal like ReScience which “targets computational research and encourages the explicit replication of already published research, promoting new and open-source implementations in order to ensure that the original research is reproducible”. If you have any suggestions, please consider posting them as answers to that question. Today I’ve also added my own answer, which I am reproducing below. Why do we need OpenMath? How do you denote the dihedral group of order n? This is not a question of “vim or emacs” or “tabs or spaces” sort, but still there are two notations in use. Some sources use Dn to denote a dihedral group of order n, and some others – a dihedral group of order 2n. Both notations are also reflected in mathematical software. The GAP Docker container is now upgraded to the latest stable release of GAP 4.8.2, announced in February. GAP 4.8.2 includes 130 GAP packages, and I am amazed how many of them are in the working order in the container – including all those requiring compilation, with non-trivial dependencies on external libraries and other third-party software. I have previously used the container for GAP 4.7.9 on an Ubuntu machine as a reference GAP installation, and this morning I was thrilled to upgrade it to GAP 4.8.2 using just two commands and waiting for no more than a couple of minutes! I still haven’t seen GAP Docker container running on Windows – if anyone manages to do that, I would be very glad to know. This would be very beneficial for users of some packages working only in the UNIX environment. How quick are new GAP releases picked up? 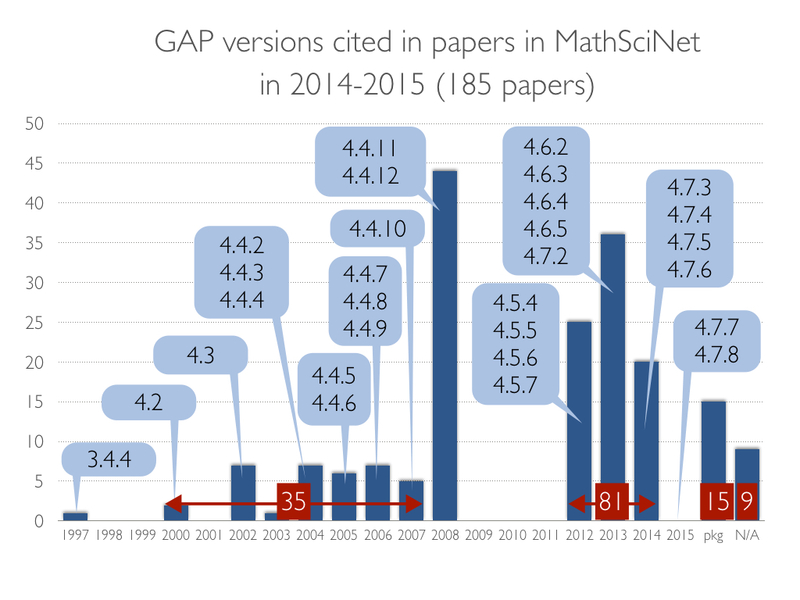 I analysed 185 papers papers citing GAP, published in 2014-2015 and contained in MathSciNet as on August 18th, 2015. The diagram below (click on the picture to enlarge) shows the number of papers citing GAP releases by the year of the release. 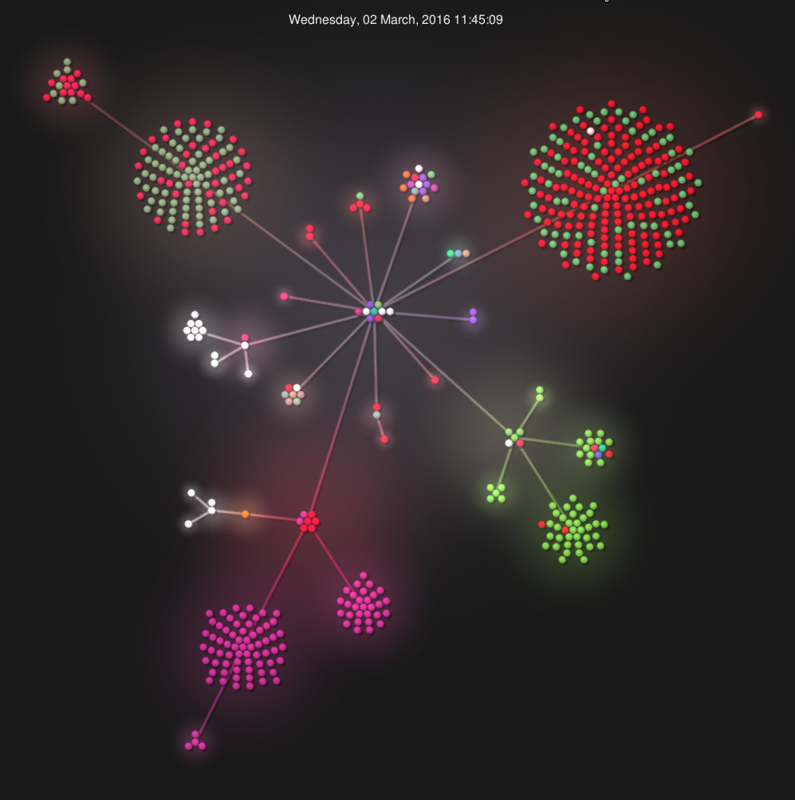 It also shows releases that were published (though not necessary cited in the analysed papers) in corresponding years. 44% (81 paper) refer to GAP 4.5.4 (the 1st public release of GAP 4.5 in June 2012) or some newer version. 24% (44 papers) cite GAP 4.4.12 (December 2008), which was the stable GAP release for several years until the appearance of GAP 4.5. 14 papers cite some GAP package but not GAP, so this only gives some hints to the version of GAP that might be used. 9 papers cite GAP without GAP version and/or release year. 19% (35 papers) cite GAP 4 releases published during 2000-2007. 1 paper genuinely cites GAP 3.4.4 because it uses the CHEVIE package. It is not surprising that there is a long tail of citations of older versions. Papers that appeared in 2014 may be submitted prior to GAP 4.5 release, or, even if they were submitted after, describe experiments that were performed using GAP 4.4.12. But it is interesting what’s behind those 35 citations of the older GAP releases. Are these real usages of outdated GAP installations, re-used bibliographies from earlier papers, or something else? Specifying the exact version of the system (as well as specific GAP packages, if their use was essential) is very important for the reproducibility of computational results. Furthermore, each GAP release contains new features and bugfixes, and comes with updated and expended set of GAP packages (see the history of GAP releases). Therefore, we suggest to always try to use the latest release, and to cite it correctly (GAP function Cite may help with that).